Cisco and Juniper made OpenDaylight contributions that integrate their own SDN features into OpenDaylight environments. The founders of OpenDaylight set out to create an SDN controller and code open for user contribution and nimble enough to act as the platform for any vendor's open SDN strategy. It's becoming more of a reality all the time. This month, Cisco and Juniper Networks made OpenDaylight contributions that will let users integrate the vendors' specific SDN styles and features into OpenDaylight environments. Juniper submitted a plug-in that will extend some of its OpenContrail network virtualization features to OpenDaylight users. Meanwhile, Cisco submitted its OpFlex code, which will allow users to implement centralized policy control in an OpenDaylight environment. The OpFlex Project is not specifically listed as a Cisco contribution, since the vendor also submitted the code to the IETF for standardization. Nevertheless, the protocol is central to Cisco's SDN strategy. OpFlex is a southbound SDN protocol that is central to Cisco's Application Centric Infrastructure (ACI). In an ACI environment, a centralized controller manages application policy on every device in the network using OpFlex to send these commands. The idea is that network policy can change dynamically in response to the needs of applications. Other SDN strategies centralize all traffic-forwarding decision making. 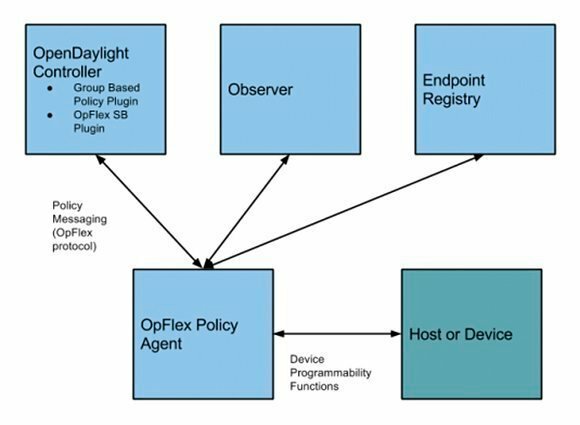 OpenDaylight's OpFlex project consists of integration of the OpFlex protocol, as well as an OpFlex SB (southbound) plug-in and an OpFlex Policy Agent. The OpenDaylight controller sends messages to the policy agent through the OpFlex SB plug-in. The policy agent then enforces policy among network devices. While Juniper Networks is a platinum sponsor of OpenDaylight, the vendor kept its distance from the organization, not dedicating engineering effort or code to the effort as other platinum vendors have. That may be changing with the submission of the OpenContrail plug-in, which will let OpenDaylight users apply some of Juniper's cloud networking and virtualization features to their own environments. OpenContrail is an open source, Apache 2.0-licensed technology that includes a network controller with its own southbound protocol and open northbound application programming interfaces (APIs), as well as a router and network analytics engine. With the OpenContrail plug-in, OpenDaylight users can use OpenStack Neutron, the orchestration software used to instantiate virtual networks, to speak directly to the OpenContrail API. That will apply Juniper's virtual networking features to the OpenDaylight environment and within the OpenStack orchestration context. Among the OpenContrail features noted in OpenDaylight documentation are service chaining through Juniper's network functions virtualization (NFV) technology and network overlay management.